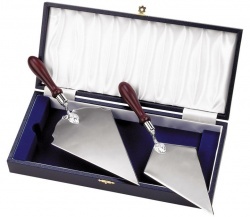 Two fine quality silver plated bricklayer trowels supplied boxed or with an optional deluxe presentation case. These silver trowels are ideal engraved as presentation or commemorative items for topping-out ceremonies or other events for building completions. They are offered here with low-cost text and/or logo engraving. 10.5in Silver Plated Ceremonial Trowel. Supplied Boxed with Deluxe Case Option. 11.25in Silver Plated Ceremonial Trowel. Supplied Boxed with Deluxe Case Option.